It’s Tax Day – What’s in Your Wallet? Host Bob Leins, CPA welcomes Tammy Flanagan, Senior Benefits Director at NITP, and Mike Causey of Federal News Radio, to talk about the best dates to retire. Host Bob Leins, CPA® welcomes Phil Gardner, Federal Benefits Specialist at NITP, Inc. If you are a Federal employee thinking about retiring in the next 5 to 10 years, this broadcast has important information for you! Deposits and redeposits for Federal Retirement: What’s that all about?! 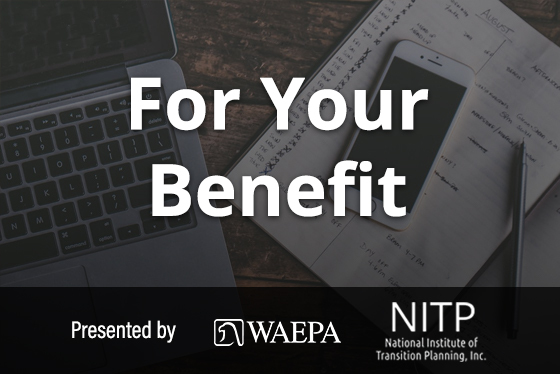 Join our host, Bob Leins, CPA® as he welcomes Maureen Wilkin, Federal Benefits Specialist at NITP, Inc. If you are or have been a Federal employee, this broadcast has important information. Host, Bob Leins and co-host Tammy Flanagan, Senior Benefits Director at NITP, welcome back Paula S. Jakub, RHU; CEO of The American Foreign Service Protective Association, sponsor of the Foreign Service Benefit Plan, to talk Population Health and Wellness in the FEHB Program. Host Bob Leins, CPA® welcomes Bob Braunstein, Federal Benefits Specialist with NITP to talk about Medicare. Host Bob Leins welcomes David Santana from the Centers for Medicare and Medicaid Services to the studio. Host Bob Leins, and co-host John Elliott, welcome Lester Austin, Retired Senior Public Affairs Specialist with the Social Security Administration, to talk about how social security coordinates with financial awareness, planning and opportunities. Join hosts, Bob Leins and Karen Schaeffer, CFP®, as they welcome Ravi Deo, Executive Director, and Kim Weaver, Director of External Affairs of the Federal Retirement Thrift Investment Board to the studio. Host Bob Leins welcomes Tom O’Rourke, Esquire to talk about a number of significant changes that affect individual taxpayers in 2018 and beyond. For Your Benefit hosts welcome Kim Weaver, Director of External Affairs, and Jim Courtney, Director of Communications and Education, Federal Retirement Thrift Investment Board to the studio this week. Bob Leins welcomes David De Jong and Steve Widdes, tax and estate attorneys with Stein Sperling Bennett De Jong Driscoll PC, to the studio to discuss the possible changes in tax and estate law during the Trump administration. For Your Benefit: Revocable Trusts – What Are They and Why Does Everyone Say I Need One? This week on For Your Benefit, Dave Love, CLU, CLTC with The Love Financial Group discusses life insurance plans at late or mid-career and pre-retirement ages. Host Bob Leins, CPA® welcomes Mike Townshend transition and aging authority and founder of Carpe Diem Coaching. Growing up in a multigenerational household himself, Mike shares firsthand experience on the topic. Host Bob Leins welcomes Mike Townshend, transition and aging authority and founder of Carpe Diem Coaching. Mike will talk about the critical importance of planning prior to retirement. Private sector job hunting: It’s much different than the Federal job hunt! Our host, Bob Leins welcomes Kathy Lavinder, founder of Security & Investigative Placement Consultants, a niche executive search firm, to speak about how the private sector job hunt is much different than the Federal job hunt. This week on ForYourBenefit, our hosts, Bob Leins and Tammy Flanagan, Senior Benefits Director at NITP, welcome Christina Eanes, lifelong superachiever, Certified Professional Co-Active Coach and author of Quit Bleeping Around: 77 Secrets to Superachieving. Host Bob Leins, CPA® and co-host Tammy Flanagan, Senior Benefits Director at NITP, as they welcome guests Gavin Toner, Jennifer Williams, and Dr. Bruce Wollman from Kaiser Permanente. Hosts Bob Leins, CPA® and Ray Kirk, Ph.D. and Federal Benefits Specialist at NITP, welcome Jeff Schwab, Vice President of Marketing at Dominion National to the studio to focus on dental benefits. Hosts Bob Leins, CPA® and Ray Kirk, Ph.D. and Federal Benefits Specialist at NITP, welcome insurance expert and author Walton Francis to the studio to talk about FEHBP open season. The CHECKBOOK’s Guide shows that most families can save $2,000 or more by selecting better plan choices. Open Season with GEHA – Government Employees Health Association, Inc. Host Tammy Flanagan, Senior Benefits Director NITP, welcomes Tom Bernatavitz, Vice-President of Aetna Federal Plans to the studio to discuss Aetna’s approach to this year’s Open Season. This is the first in our series of weekly shows devoted to the range of health insurance plans available to Feds during Open Season. Aetna offers a variety of affordable innovative plan options for Federal employees and retirees. Host Bob Leins and co-host Bob Braunstein, Federal Benefits Specialist NITP, welcome Jay Fritz, Program Manager, Program Support and Analysis, Healthcare and Insurance, U.S. Office of Personnel Management to the studio. Host Bob Leins and presenters from the National Institute of Transition Planning, the federal leader in retirement planning seminars, take your calls and emails every Monday. Each week, the show focuses on a specific area of retirement planning from financial security, taxes, federal benefits and estate planning, to life after retirement. Email your questions and listen live here!